Circus Musicians: At Least They Have a Gig! 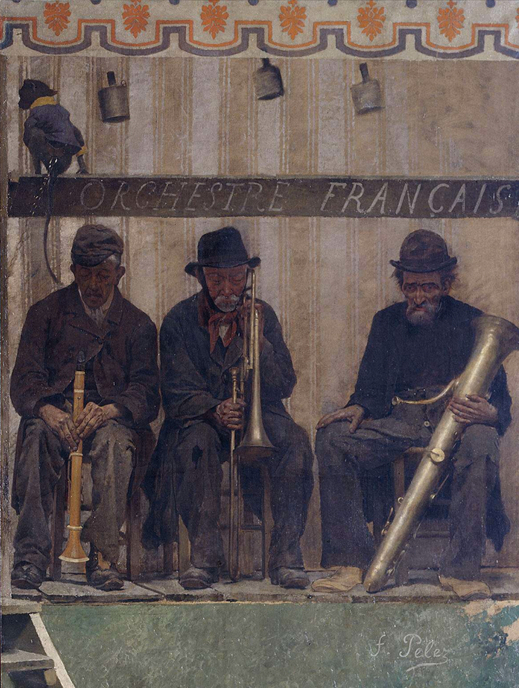 1888—Paris, France: Fernand Pelez’s Grimaces and Misery depicts poor circus workers situated on a platform, including a group of three seated musicians (see above detail and full image; public domain) (Musée du Petit Palais, Paris). 1888—Paris, France: Georges Seurat depicts a circus trombonist in Parade de cirque (see above image; public domain). In contemporary photographs the circus that Seurat portrays, identified as the popular Cirque Corvi, reveals a trombone hanging from a pillar near its entryway. 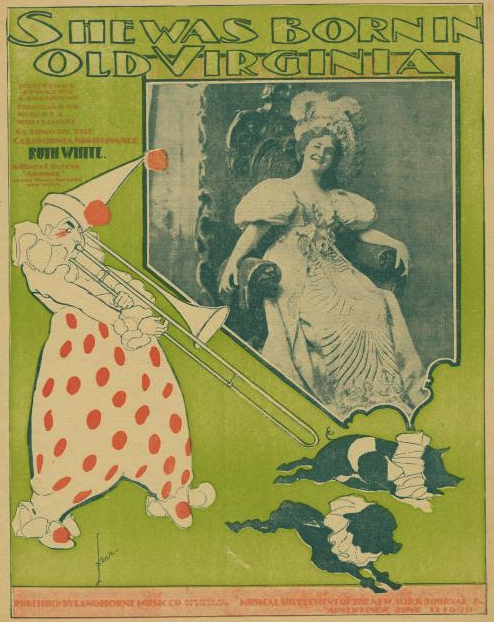 Advertisement posters of the time depict a clown standing on the central pedestal occupied by the trombonist in Seurat’s painting (Herbert, Seurat 137-143). 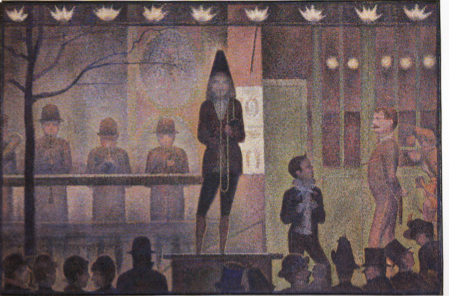 An exact contemporary of Seurat’s work is seen in Fernand Pelez’s Grimaces and Misery, which depicts a similar scene, this time with two clowns on the central pedestal and three musicians, a clarinetist, trombonist, and ophecleidist, seated to the right of center (Herbert, Seurat 152). One more thing might be worth noting. 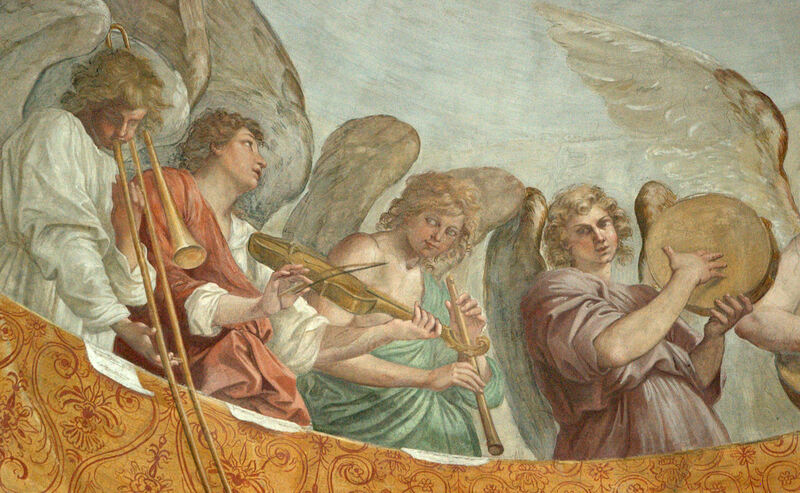 As trombone images move from the intensely religious, particularly in the 17th century (1st half, 2nd half), to the many humorous depictions of the 19th century (2nd half), the association of trombones with clowns begins to take shape. 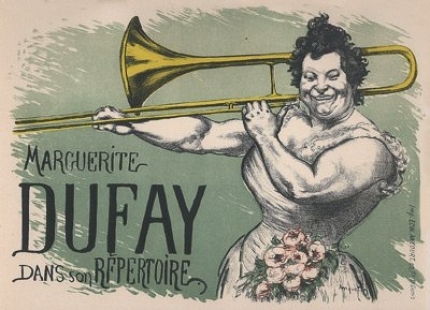 It can be seen not only in the above two paintings, but in images such as the the Anquetin lithograph (below), the “Old Virginia” cover (below), and, later, even in solos like the famous Berio Sequenza V (1966).